PEACE – a fragile condition. A thin red line is the border between peace and discord. Peace is based on the values of loyalty, trust, respect, liberty and open minds. Though peace has to be adapted, refreshed, transferred all over the ages to avoid losing it at the end. The populist propaganda as well as the absence of discourse emphasizes the presence of fear. There is a kind of ignorance on the subject PEACE, believing it is still available when and where we need it. Though peace is vanishing every day a bit more and we urgently need utopian counter proposals. Peace is a social construct which infects the society, economy, even the daily human conditions, no matter if it is present or absent.Peace fails when utopia is fading, peace will not be valid without utopian ideas. The show „All about peace“ is a trial to visualize the wide range from peace to discord and the many diverse positions in between. Artists with Hungarian and Austrian roots, meanwhile spread all over the world, are participating and using different genres of contemporary fine art. The juxtaposition of different approaches and various positions is mirrored in the different medias and the curatorial display. The show will extend the exhibition space to the public, the video „Kiss“ by Franz Wassermann will be screened on the wall of the Knoll Gallery at the opening night. „Deer Scarer“, an installation by Peter Varnai, will be the counter part outside. Varnai sets up a portrayal of the fragile and self-contained nature of social disobedience – captured from the perspective of passing time. The quintessence of the work is drawing a line between the universal motion of nature and the repetitive process of socio-political movement. The confrontation of a quite romantic, but also sentimental kissing in Wassermanns video, created in 1998, and the disturbing machine „Deer Scarer“ reflects the great disparity in the deeper sense of the word with its fragile constitution. When entering the room of the Knoll Gallery again the display confronts the visitor with associative art works, from video installation to sound, from photography to performance, from utopia to reality. Zsuzsi Szegedi explores in her video work „Crisis of the Invisible“, 2016, the effects of failed utopias on identity, domestic silence, invisibility as a non-effect. This piece is part of a larger series that visualizes voicelessness. She works with the requisitioning of conditions of absence and how they are affecting the human body. In her multimedia installations she is pointing out their universal relevance. To understand the urge of working with the terminus of absence, Szegedi is speaking of, we have to dive in the political and social development in Hungary and the enclosed atmosphere till 1989. Controlled by the state with the inability for free thought the thinking is shrinking and the space for operations is narrow. Agnes Hamvas makes in her postcard edition „Jelentkezz“, 2017 and her sound installation „sync“, 2016 the main gap between perception and reality, visible and audible. „Jelentkezz“ shows a flying bird, connected with the title, which means „write again“. The association immediately leads to expecting a carrier pigeon. The second connotation is dove of peace, an international icon. But the truth is that the flying bird is a seagull, a bird not known for a peacefully behavior. In her sound installation „SYNC“ Agnes Hamvas´s narration is based on 3 sources, found postcards, entries from a holiday photo album, as well as diary notes. It tells about the fragile peace between the couple, which was traveling through Germany in the 70ties. The delicate hints against each other and against „the others“ mirrors the attitude of the partnership and preconceptions. Michael Kochs „Fallen Angel 1805“, sculpture 2018, is a sign of the fragility of human and the relating thereto brittleness of peace.The establishment of a functioning wealthy society is closely linked to a peacefully period. The unsophisticated minimalism of Koch´s sculptures and wall reliefs are surprisingly touching. Neues Csaba´s „Man of the 21st Century“ is related to catholic iconography, like St. Christopher a man is caring children on his shoulders. In fact the artist has photographed a refugee with his children crossing the Hungarian border, one day before it was closed. The painting is a metaphor, bringing the children to a better world, with future and perspective, and most of all, peace. Emilia Jagica and Anikó Kiss make the Sisyphos Myth a subject of discussion in their performance „Awakening“. Keeping peace sometimes shows up like the urgent need of Sisyphos to roll the immense boulder up the hill. Keeping peace means repeating the endeavour like Sisyphos was repeating the action for eternity. „Visitation“ by Esther Strauss is a story about bereavement. Strauss processed loss of her grandmother by slipping into her role while staying in grandmother´ s apartment during one night. The project appears like a ritual, which in the course of hours, evolves into a distinctively authentic action. The initiation transformed the grief to an inner peace. „Kiss Kiss“, photography 2017, by Hubert Hasler deals with the concept of an enemy and related attacks as well as with the obscenity of animal husbandry and nutrition industry of today. The waste of living beings on the one hand and starving millions on the other hand are deregulating every condition for a peacefully togetherness. Andras Nagy was researching the homeless scene in Budapest and took photos with his smart phone. Because he himself is temporary part of this scene, he got confidence and the people trusted him and so he was able to get insights into the small peace on the margins of society. The square formate, related on Polaroids, is underlining the spontanous caught but intime moments. While our stylish cultivated society consider ourselves to be in paradise we have forgotten being alert. Advanced technology and the smart world has created an artificial bubble of surveillance instead of safeness and humanity. Agnes Varnai cooperates with the underground activist group „Burn your Home“ for investigating our maximized life and will help them to generate improbabilities in our system. The common objective is to gather people and encourage them to collaborate and communicate, which will bring back human dignity for sure. The exploration and questioning of the subject „Peace“ becomes obvious in the different art works. 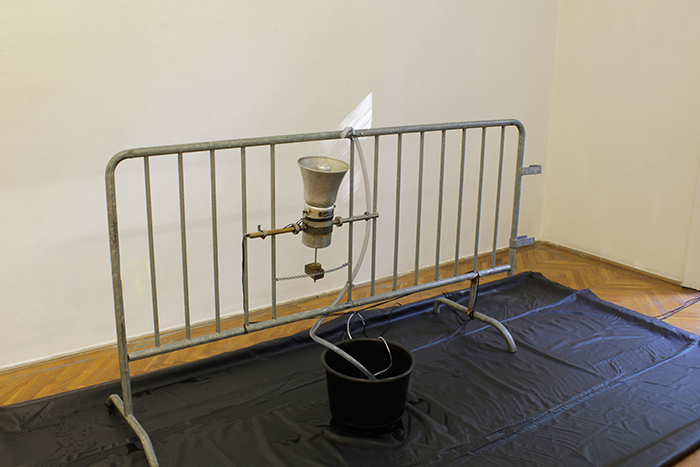 The approach is diverse and a tendency towards dystopia becomes visible in the artistic contributions. The conclusion of this attempt at discovery is that peace depends on many different factors and is closely linked to our well-being. There is inner and outer peace and, in truth, we are currently jeopardizing both. Hopefully the show will stimulate debate, we must not lose sight of peace through dystopia and fear! Agnes Hamvas´s narration is based on 3 sources, found postcards, entries from a holiday photo album, as well as diary notes. The different texts come from 3 sound sources, which can be manipulated by the visitor. The various registers (read by Stefan Wieland, edited by Elias Berner) mark the moment in which they are recorded, which information is filtered or reproduced. The meaning of the moment, the experience, flows into the text. consumption – then and now. one indulges in excessive meat consumption. The current discourse can thus be broadened to the topics of nutrition, factory farming, and economic exploitation of particularly Eastern European workers in the meat processing industry. The pig heads in this image, unaffected and authentic, speak for themselves and their fate. It is the latest work from the Happy End series by Hubert Hasler. “Awakening” is a unique form of performance: a shared, inter-corporeal and inter-genre, experience of rudimentary states of the flesh stamped in a mythic, phantasmagoric, polymorphous and dynamic, intermixture of ‘proto-bodies’, animate body parts, and graphic acts evocative of Empedocles’ cosmogony and Camus’ insight into the myth of Sisyphus. This performance is the result of a meeting between a visual artist: Emilie Jagica and a choreographer/dancer: Anikó Kiss. The two artists’ basic mode of work is that of mutual incitement and affront that strips their bodies and movements of their everyday meaning. It contextualizes itself in its own visual traces and leads, through trial and error, to the co-creation of a scenography slowly unraveling a plot of facing and revolt, a facing of the unresponsiveness of nature and a revolt against the senselessness of the traditional categories of human life. The activities of both of these artists associate with today’s mankind; their constant need to aspire, their necessity to work; the monotonous, mechanical exercise of life; while at the same time it reveals the key to gaining a sense of life, which may be found through creativity, through child-like (sincere) joy and through the experience of a new insight. „Fallen Angel 1805“, related to the pseudonym of Tolstoy, with wich he first published a part of the big essay of War and Peace in 1862. Tolstoys aim was to blur the line between fiction and history for getting closer to the truth. The wide range between the two poles are filled with personally histories of fail and success, the historical and cultural context in the aristocracy is reflected as well. While waiting for peace, male characters are fading, dying, while female personal is collecting its strength and turn out in most powerful women, like pillars of society. One of these lost souls are the abstracted figure by Michael Koch, leaning on the wall, body and soul emptied, decayed and fold in itself, collapses without hope. Koch´s reference to literature and the great gesture brings the topic of the exhibition with it. Koch is a minimalistic artist with a wide approach on philosophical level and influenced by music, literature and movies. Michael Koch oszillates between painting, sculpture, new media and music, he loves electronic music which influences his pictorial work. According to Walter Benjamin, not only the movement of the eyes belongs to looking, but also their decommissioning. Decommissioning the view is one of the topics Michael Koch is focussing in his fine art projects. András J. Nagy started taking pictures of graffiti using his father’s Leica M4 at the young age of eight. Born in Hungary, he grew up in the South Bronx and South Brooklyn and subsequently lived in various cities on several continents. The black-and-white photographs Nagy, who is still active, created as he roamed the planet not only document the diverse environments in which he found himself; more importantly, they tease out the subtle compositions those places. In his photographs meet elements of architecture, consumption, poverty, daily life, nature, decay or human existence. In such transitional places as streets, shops, car parks, construction sites, public transport, passage undergrounds or stopovers one can find those contradictions which characterize Nagys photographs and turn them into a pointed snap-shot of the society we are living in. Those places imply a dialectic meaning: For the ones neutral passages, which they automatically pass by in their daily life, for others like homeless people called „home“ or „living room“. Since his beginnings in photography, András J. Nagy focused on the marginal groups of society – from subcultures to homeless people or drug addicts. Mostly unnoted or even despised, they organize their lives in the shadowy gaps of society. Painting of Csaba Nemes refers onto the refugge-crisis as first historical turning point of the new century. He photographed a young father bringing his children in his hands and on his back, crossing the Hungarian border on the day before its closing. The photo based painted portrait recalls the – from christian iconography well-known – figure of Holy Christofer, bearing the Child on his shoulthers, evoking indirectly the basical expectations of the christianity. The work of Nemes is opposed to the media-cliches at the same time, showing not just young men&#8217;s hade arrive to Europe, looking for better life, but human beiings, who are looking for shelter in Europe, not leaving their beloved behind. Tirol, and anywhere she can take a walk. “Zsuzsanna Szegedi Varga explores in her video work „Crisis of the Invisible“, 2016, the effects of failed utopias on identity, such as domestic silence. These works are part of a larger series that visualize voicelessness and its effect on the human body. The video works bring attention to the importance of language in autonomy by visualizing their audience—the absence of the individual voice—to the point of aestheticizing the strangled state. The poetic suffocation leaves us with nothing more than feeling the feelings—reclaiming the value of sensitivity, especially when representing from within constraints. These two video works have multiple titles, keeping a record of reactions to the various locations they are shown. With this the artist emphasizes there is no true universal relevance, meanings change from one context to another. “Residue” is a pile of clothing, pieces of remnants of Szegedi’s erasing performance that took place in 2013—out of its originating context—6700 km from Budapest. For anyone who needs to dive into narrative, “Double Erasure”, 2017, an artist book based on interviews is also on display. Written in English, aiming to translate a specific absence, hoping to renew, while writing against deep cultural blockages of the past and also an increasingly paranoid present. “Whose Piece? Whose Reality”, 2018 was created as a response to another contextual constraint. The writing on a small mirror is only partially legible form the oversized lamp that is too close against it. By washing it with soap, the reflection softens and writing becomes visible, for a moment until it’s washed away. Burn Your Home is an underground acivist group emerged in the 21. century. Their intention is to bring the improbability back to our lives. To achieve their goals they boycott algorithms, attack the GPS system, and organise numerous guerrilla activities in the public space. The anonymity of the collaborators creates a hard time for the investigating authorities. Until they don’t take the right measures, B.Y.H will keep on generating improbabilities in our systems with the belief that these glitches are what brings us together, and makes us more human. There’s a Japanese invention, designed for keeping the wild away from the soils, using the basic tools of water, pipes, and gravitation to generate noise. Mixing the same elements, the installation entitled Deer Scarer by Peter Varnai sets up a portrayal of the fragile and self-contained nature of social disobedience – captured from the perspective of passing time. Plastic pipes wriggled around a cordon, noise of protesters lacked in a metal horn, and a bucket. An infinite, moving circle of water runs through the pipes and splashes the murmur of people. Voice of the masses, bubbling, and the constant crashes of the bucket full of water get together in one rotation loop, a metaphor of the stationary motion in the body of any society. Repetition, a fundamental element of this process is both tiresome and hypnotic. Components of natural and sociological structures meet as it washes, suppresses and releases the sounds of social disobedience, dying and than resurrecting with every turn – Flowing in a never-ending circle like an Ouroboros, biting it’s own tail time to time. What is left is a meditative view of an evergrowing circle of scars and recoveries, drawing a line between the universal motion of nature and the repetitive processes of socio-political movements. Peter Várnai was born in Dunaújváros, an industrialised city in Hungary. Currently he studies art at the Univercity of Apllied Arts Vienna.His artistic vision is strongly influenced by both the post communist atmosphere of the city he was brought up in and the general political situation of the co untry he came from. The topics he is working with are always universial and global just like the thougts he is trying to provoke with them. The video THE KISS shows two men kissing, hugging and caressing each other. Franz Wassermann carries these private gestures of love to public space. There he addresses the voyeuristic aspects of his piece. Franz Wassermann, born in 1963, lives and works as a sculptor in Vienna. He is concerned with structures of power in our society and explores the coming and going of power and powerlessness that influences the individual as well as the collective. His performances and sculptures deal with tabooed issues like for example sexual abuse of children (SCARS), National Socialism and culture of remembrance (TEMPORARY MONUMENT), Aids and stigma (BARBIE + KEN = HIV+), migration (ADMINISTRATIVE DETENTION OF ASYLUM SEEKERS), authority and symbolic capital in the cultural sector (ALBERTINA, ICONS) and the power of the media and the image (ACTION CARRIERS).